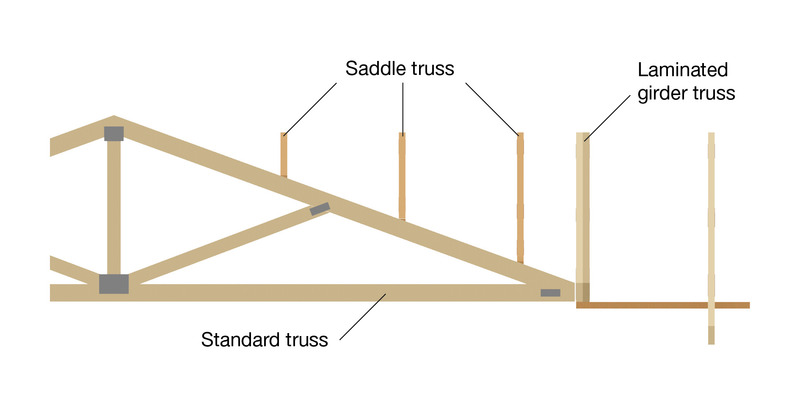 Connection of valley trusses to the supporting truss for a low wind area shall be in accordance with the details shown and described. 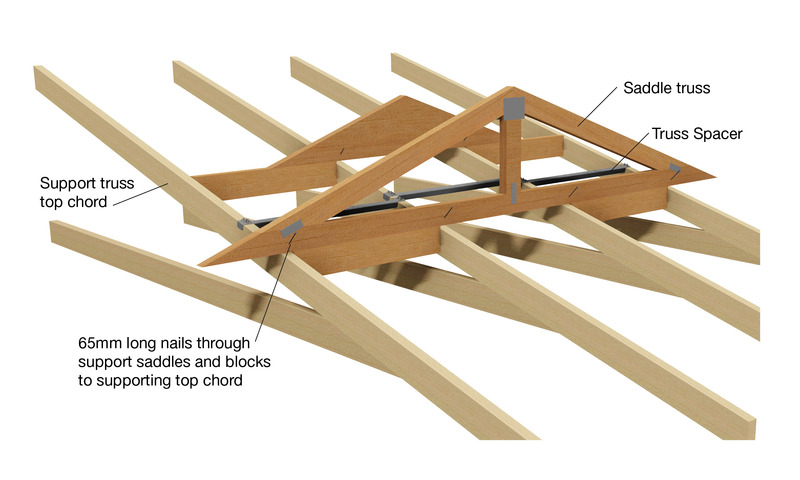 Roof pitch ≤15° - one effective 75mm x 3.05Ø nail through bottom chord of valley truss into top chord of supporting truss at each intersection of the trusses. 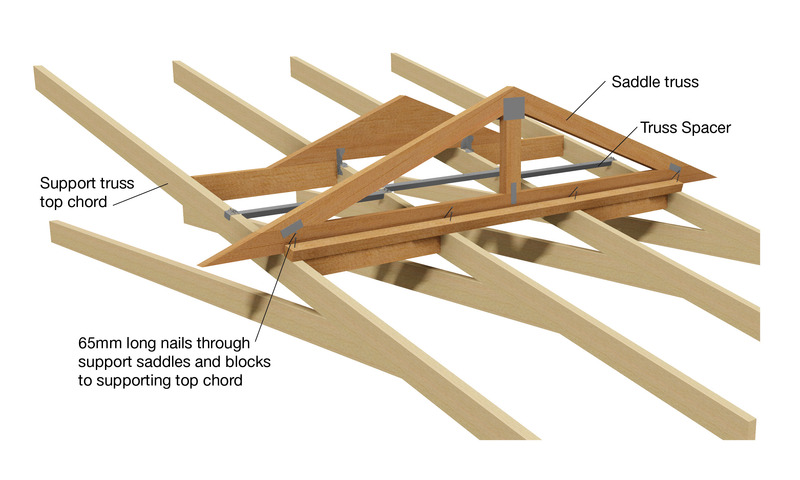 Roof pitch > 15° - one effective 65mm skew nail through bottom chord of valley truss into top chord of supporting truss at each intersection of the trusses, plus one 35mm x 45mm minimum timber block nailed to supporting truss top chord with one 75mm x 3.05Ø nail or one framing anchor without timber block. 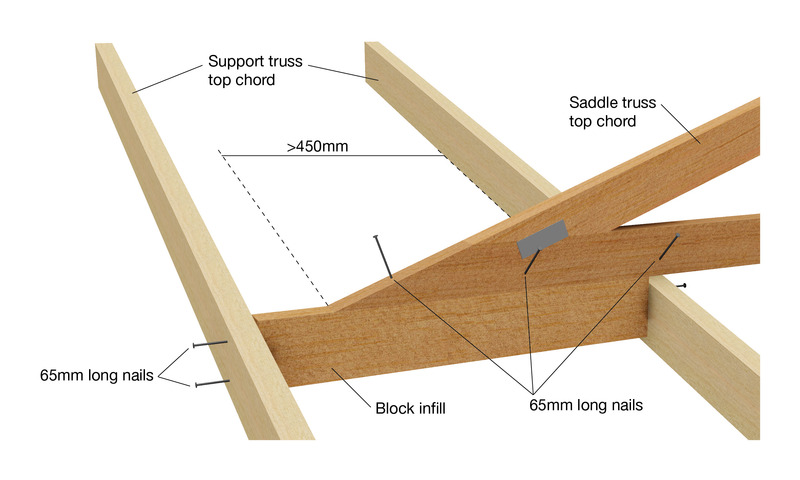 Block infill - (minimum of 70mm x 35mm) to where the valley truss is cantilevered more than 450mm or where the valley truss is not supported by two truss top chords, fixed to the valley truss bottom chord with 2/75mm x 3.05Ø nails, and each end to supporting truss top chord with 2/75mm x 3.05Ø nails. Connection of valley trusses to the supporting truss for high wind area shall be in accordance with the details shown and described. Supporting trusses with a ceiling - one framing anchor with 4/30mm x 2.8Ø reinforced-head nails to each face. Supporting Trusses Without a Ceiling - two framing anchors with 4/30mm x 2.8Ø reinforced-head nails to each face. Block infill - (minimum of 70mm x 35mm) to where the valley truss is cantilevered more than 450mm or where the valley truss is not supported by two truss bottom chord with 2/75mm x 3.05Ø nails, and to each end of supporting truss top chord with 2/75mm x 3.05Ø nails.